FERNDALE, Wash. - Dec. 22, 2016 - PRLog -- AlyBlue Media announced the release today of Grief Diaries: Through the Eyes of Men, the 20th title in the award-winning anthology book series. 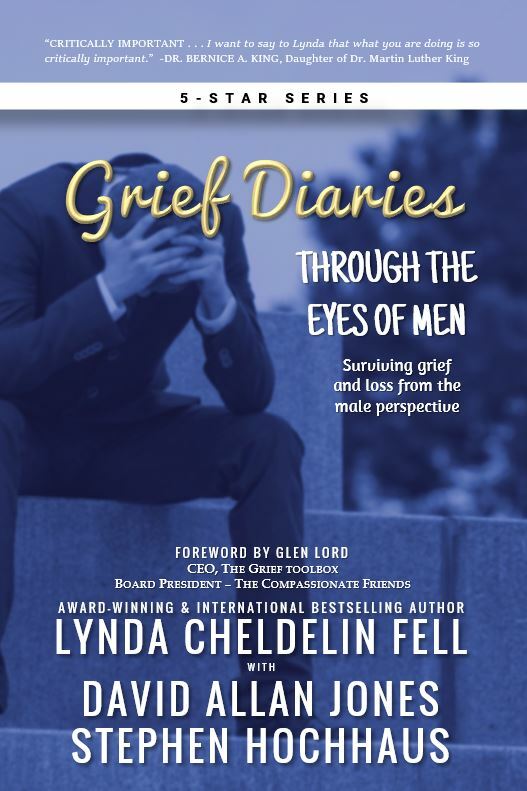 Series creator Lynda Cheldelin Fell partnered with authors David Allan Jones and Stephen Hochhaus in the compilation featuring the stories of 14 men sharing insight into the hidden world of grief and loss from the male perspective. "Men do cry so it's important to break the man-code and open the dialogue, because silent grief is deadly grief," says Cheldelin Fell. Her own husband suffered a debilitating stroke at age 46 after the couple lost their teen daughter in a car accident in 2009. "I wish this book had been around when we lost our daughter so I might have had a better understanding of my husband's grief. Would it have prevented his stroke? I'll never know. But I'm comforted that it's now available to help others to better understand loss through the eyes of the men they love." "Through these stories of heartache and survival, all men are given the permission to grieve the way they need. They understand that their grief is not unique to them, that it has been shared by others. This will also offer hope to the women who want to help and understand the men they love," said Glen Lord, president of the national board of The Compassionate Friends, a nonprofit organization serving the bereaved. Cheldelin Fell released the title, the 20th in the series, on the one-year anniversary of the first Grief Diaries, marking a professional milestone. In the past 12 months, the series has grown to over 500 writers from 11 countries and earned 4 literary awards. Each book in the series offers personal accounts about life experiences, earning acclaim from some of the world's most notable influencers including Dr. Bernice A King, daughter of Dr. Martin Luther King, Jr. and Candace Lightner, founder of Mothers Against Drunk Driving. Cheldelin Fell donates a portion of retail profits from every book to nonprofit organizations. For more about Lynda Cheldelin Fell, visit www.LyndaFell.com. For more about Grief Diaries, visit www.GriefDiaries.com.